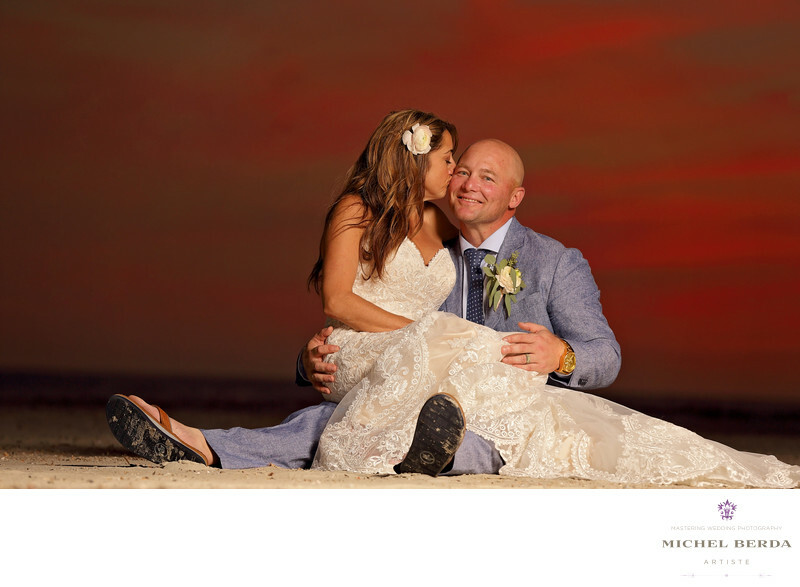 One of the beauties of nature and wedding photography is the connection between the sunset and the wedding clients. I capture many of these in Hilton Head weddings. Typically my clients hire me for my 3 plus decades of photography knowledge. Why does this matter, well let's look at it from a standard daylight 5 years and less wedding photographer...Most I would say 75% of wedding photographer rely on the ambient light it is very basic wedding photography and they rely on the camera meter in today's technology to make all of the adjustments. When you are researching a wedding photographer and find yourself bouncing from website to website that is a clear determination that they all are just alike. While wedding photography is subjective, you need to keep youy eyes on the art and make very sure that those wedding photography website that has that art that appeals to you should be saved as your favorites. Here is why. You as a wedding client are spending 35% of your wedding budget on wedding photography to us here at King Street Photo Weddings we call this a huge investment and we truly believe that. Well our scenario is very simple would you hire a lawyer or a doctor that has 5 years or less of experience and knowledge in his on her craft or would you have peace of mind and a huge trust on one that has decades? Remember your weddingis only one day. There is absolutely no redo. ..Next comes the equipment that said wedding photographer brings, I will tell you that 85% of wedding photographers rely on their camera flash. Way too basic for us, we bring many softboxes, major strobes, and umbrellas. All this is heavy and a lot of equipment to bring to a wedding but we do...Knowledge is setting your camera on manual, and setting your strobes on manual and knowing how to calculate and do the math to match is another huge topic. However even taken that into account can you do all this in what is typical among all clients to capture this in 15 minutes...Well if you took the time to read this, and you saw this amazing sunset wedding photo then you have educated yourself and you are the type of client that I am looking for, one that does his or her due diligence to make very sure to hire the best wedding photographer. Has in this example that I capture in many of my Hilton Head weddings.Keywords: Hilon Head Island sunset wedding photos (3), Hilton Head Island SC (3), HILTON HEAD ISLAND WEDDING PHOTOGRAPHER (18), Michel Berda (1140), Palmetto Dunes (6), Palmetto Dunes weddings (3), photographer (1125), Sunset wedding photos (3), Wedding Photographer (1254), weddings Palmetto Dunes (3).